Baltic amber is an organic fossil resin formed about 30 to 50 million years ago by pines (pinus succinites), now extinct, from the region of Scandinavia. Due to an increase in ambient temperature at that time, these pine trees began to produce ample amount of amber. This immense amount of amber was charged to the Baltic Sea due to the geographical factors of the tectonic plates, and the Baltic amber expired mainly in the regions of Kaliningrad and Lithuânia where it is extracted through mining and fishing, respectively.It is very rare, but Baltic amber may contain insects and other animals from the time when it was formed, constituting itself in a paleontological collection of great value.Amber exists in several countries, but this Baltic region, more precisely Kaliningrad, holds about 90% of all world deposits of high quality amber. It means that baltic amber is much more precious, valuable, rare, and beneficial than any other type of amber. Do you know why? Because in addition to being millenarian, Baltic amber is the only fossil resin in the world containing 3 to 8% succinic acid, a naturally therapeutic substance very effective in fighting inflammations and improvements in the immune system. In contact with the heat of the skin that absorbs such acid, the therapeutic process begins. Fascinating to know more about what is Baltic amber, is not it? Thank you very much, dear King Paco for interesting information about Baltic amber. 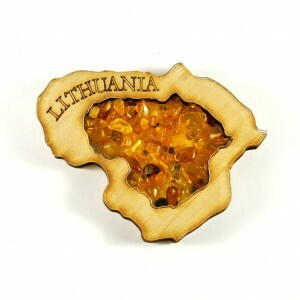 Amber is called Lithuanian Gold and it is true because it is very valuable.